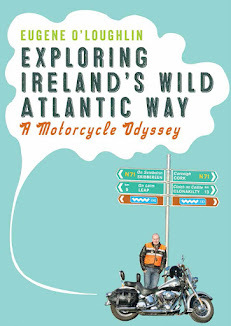 Today I started the first section of my round trip of Ireland on my Harley-Davidson motorcycle via the coastal routes. I set out from Dún Laoghaire and headed for Wexford, with no timetable or particular destination in mind. It must have been one of the finest days this summer so far - my fingers are crossed that I get good weather over the next couple of weeks. First port of call was to Shankill where I got a cup of coffee and stopped to say "Hi" to my cousin Anna. I got an excellent coffee at the One café and dropped into my uncle Pat's PM O'Loughlin foods. Anna is going to climb Kilimanjaro in Africa later this month for charity and I wished her luck - hopefully I will have some tales to tell from my own trip when next we meet at a fund-raising coffee morning Anna is holding on August 11th next. On the O'Loughlin side of the family, Anna is the youngest cousin and I am the oldest! Next up I headed through a very busy Bray where there were plenty of posters wishing local boxer Katie Taylor the best in the Olympics - she is hot favourite to win gold and the whole country will go into a state of depression if she does not win. Bray always seems to have a carnival atmosphere, and today was no different - with Ferris wheels and carousels galore. I stopped to take some pictures, but I discovered that my 12MB Olympus camera had a dead battery. My first lesson - charge everything! So most photos today will be with my 5MB iPhone. I then decided to keep going towards Greystones. Greystones is a lovely sea-side town, but I have not visited it very often. The new marina looks great - I believe some people opposed its development but it really adds to this town. I stopped on the coastal road south to take some photos, and came across the large anchor to the left. A pity to see the old La Touche hotel boarded up - I do recall going there for Sunday lunch many years ago. Next up I headed south for Newcastle where I called on my Aunt Mary O'Loughlin and my uncle Dónal. I never fail to get a great welcome, and though I claimed I would only stay for a couple of minutes I ended up chatting for half an hour. Mary is my Dad's sister and has always been a favourite Aunt of mine. I know she reads this blog, so I better mind my manners! Love you Mary and thank you for the welcome! I also got to see some newspaper cuttings from her scrap book, and I was especially interested to see an article on the death of my Grandfather (PJ O'Loughlin) who died on June 19th 1965 - presumably from The Wicklow People. I will write more about this in a later blog post. After Newcastle it was down along the familiar road to Rathnew, but I had seen on the OSI Road Atlas that there was an airfield nearby - so down I went to see the Newcastle Airfield. 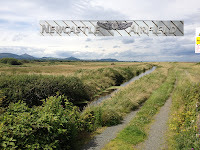 It is right by the rail road and the sea - in the photo to the right you can see the short airstrip in the middle which is being mowed with a tractor. In the distance is the Sugar Loaf - a fantastic setting to take off and land an air plane. Moving on I headed towards Wicklow town. This involved going onto the very familiar Rathnew road to the administrative capital of my native county. In many senses Wicklow is a weird county in that the main town is not on any direct route. While I have passed though the nearby Rathnew hundreds of times, I do not go to Wicklow town that often. But what a treasure I have been missing! Wicklow is a historic and beautiful town with a large harbour which is surrounded by daunting old cannons. I went down to the port (where I have never been), and the view from the new roads is brilliant over the town. Wicklow is set in an attractive hill side location, and I'd quite fancy living on the hills overlooking the town. But it was time to move on and travel a road I had not completed before. Between Wicklow and Arklow, the coastline is dominated by wonderful beaches like Silver Strand and Brittas Bay. Lots of caravan and camping parks, plus golf courses. The biggest one around here is the European Club. I played this club just once and I remember it only for two reasons: one was that it was very difficult and the other was for a score of 13 on one hole. For a while this was my record score until I hit a 14 on a course in Scottsdale Arizona soon afterwards - this is still my record score! The road here was quite difficult and was flooded in many places. I stopped at Mizen Head, but despite hearing it mentioned every time I heard a weather forecast - it was nothing more than a bit of land sticking out into the Irish Sea. At this stage I was getting close to Arklow and I could see the well known "Arklow Rock" in the distance. I have been to Arklow many times before, but had not gone down to the harbour area. This was a much busier place in times past, especially when Arklow was renowned for its pottery works. This was also my first petrol stop - €28 to fill up. After this I headed towards Clogga Beach and for closer views of the Arklow Rock. I'm sure the boarded up and for sale Clogga Bay Hotel is indicative of former glories for this area - but it was very quiet today. The last photo below shows a view north from Clogga. I was near my destination for the first part of this trip - the Wicklow/Wexford border at Kilmichael Point. It had taken four hours to cover just 58 miles (93kms). At this rate it will take me forever to get around Ireland - so I'll have to be a little bit more direct in my travels. I have no more relations for a while, so that should speed things up (with apologies to Anna and Mary).